The nervous and immune systems share common functions: both are involved in adapting the body to the environment and in maintaining homeostasis. Because they are the two major adaptive systems of the body it is not surprising that they have developed common strategies: both are able to sense external and internal variations, which are signaled to specialized cells causing the activation of specific and rapid responses. Through these well orchestrated responses the two systems not only restore homeostasis but retain the memory of the “danger” so that faster and more specific reactions will be triggered after subsequent similar challenges to homeostasis. To be able to orchestrate a strictly integrated response, the two systems should act simultaneously, communicate with each other and work together to eliminate danger and restore homeostasis . Thus, for a more efficient control of the internal environment, cross-talk between the nervous and immune systems, based on close anatomical connections [2,3], common chemical signals and specific receptors [4-6], is needed to sense challenge to the host, monitor immune activity and activate neuronal pathways and regulatory loops [7,8]. Among the growing number of molecules known to be involved in both neuronal and immune modulation, Nerve Growth Factor (NGF) seems to have a role in this complex network of bi-directional signals between the nervous and immune systems. NGF is the best-characterized member of the neurotrophin family, a group of proteins that have similar structures and functions . The amino acid and messenger RNA sequences of this neurotrophin have been categorized and indicate that NGF is a highly conserved molecule that shares considerable homology within different species [10,11]. The biological effects of NGF are directly dependent on its initial binding to cell surface receptors: TrkA and p75NTR . TrkA is a transmembrane tyrosine kinase of 140 kD; it is the specific receptor for NGF and is phosphorylated on tyrosine residues after binding of its ligand. p75NTR is a 75 kD glycoprotein that belongs to the TNF-receptor superfamily and is known as the pan-neurotrophin receptor because it can bind not only NGF but also other neurotrophins with similar affinity. NGF signalling through TrkA elicits the majority of the actions ascribed to NGF. Through the binding to its receptors NGF triggers numerous intracellular signalling cascades: the major pathways activated by NGF through TrkA are Ras, PI3-kinase, PLC-gamma1 and their downstream effectors, while the p75NTR-mediated signaling pathways are Jun kinase signaling cascade, NF-kappaB activation and ceramide generation . NGF was identified for its ability to sustain survival of sympathetic and sensory neurons during embryonic development. The pioneering studies of Levi-Montalcini showed that during development, limited amounts of NGF produced in target organs are responsible for the proliferation, differentiation and survival of peripheral autonomic and sensory neurons . The neutralization of NGF with anti-NGF antibodies during fetal life results in irreversible destruction of the sympathetic ganglia and in a marked reduction in sensory neurons . The critical role of NGF in the development of the peripheral nervous system has been further confirmed by studies using knockout mice [15-18]. ngf -/- and trkA -/- mice have almost no sympathetic ganglia and a dramatically depleted population of sensory neurons in dorsal root ganglia (DRG). The neuronal loss is selective and affects small peptidergic neurons that mediate pain. In adult life, while sympathetic neurons continue to depend on NGF for their survival, there is a shift in the role of NGF in the sensory neurons. While NGF is no longer indispensable for their survival, it is crucial for the maintenance of a differentiated phenotype. In these mature sensory neurons, as well as in sympathetic neurons, NGF dynamically controls neurotransmitter and neuropeptide synthesis. In sympathetic neurons the levels of norepinephrine are regulated by NGF through selective induction of tyrosine hydroxylase (TH) . In DRG the expression of Substance P (SP) and Calcitonin Gene-Related Peptide (CGRP) is under NGF control [20,21] and in vivo deprivation of NGF, as a result of nerve transection or anti-NGF treatment, causes a marked decrease in SP and CGRP synthesis in DRG . In adult life, a constant supply of NGF from the innervation field influences the neuronal plasticity that allows the adult nervous system to modify its structure and functions in response to stimuli. The constitutive synthesis of NGF in adult tissues correlates with innervation density and influences cell body size, axonal terminal sprouting, dendritic arborization, induction or inhibition of neuropeptides and neurotrasmitters or transmitter-producing enzymes [19-26]. In mice that overexpress NGF in epithelial structures [27-29], there is a dramatic increase in axon numbers, alteration of fiber distribution, increased branching and modification of the neuronal phenotype in target organs. The spleen of the transgenic animals and the peripheral lymph nodes, by draining lymph from NGF over-expressing tissues, show different innervation patterns and fiber density and these characteristics are more pronounced in animals with higher levels of NGF expression . Numerous studies have shown that during the inflammatory process there is a localized increase in NGF at the sites of inflammation. Increased NGF concentrations, which closely follow the course of disease, were initially found in the cerebrospinal fluid of Multiple Sclerosis patients , in the synovial fluids of Rheumatoid Arthritis patients  and in the sera of Systemic Lupus Erythematosus (SLE) patients [33,34]. NGF mRNA expression and protein levels increase in animal models of inflammation such as Freund’s adjuvant-induced and carragenin-induced arthritis [35,36], in NZB/W mice, a spontaneous model of human SLE , and in experimental autoimmune encephalomyelitis (EAE) . 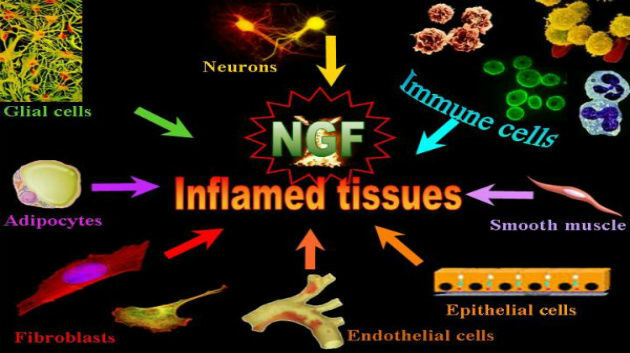 NGF enhancement seems to be a common feature of many other inflammatory diseases  such as interstitial cystitis [40,41], allergic asthma [42,43], vernal keratoconjunctivitis , Crohn’s disease and colitis [45,46], psoriasis [47,48] and atopic dermatitis . The data obtained from all these in vivo studies have clearly indicated that NGF synthesis is up-regulated during an inflammatory process and that inflammation and tissue damage generate mediators that control the local concentration of NGF. Inflammatory cytokines such as IL-1beta, TNF-alpha and IL-6 are able to modify the basal production of NGF in the organism and induce the synthesis of NGF in a variety of cell types and tissues (Figure 1). Figure 1. Inflammatory stimuli influence NGF production in tissues. This effect appears to be mediated by a direct action on immune cells (reduced migration and antigen presentation and increased production of IL-10). Inflammatory process and tissue damage generate mediators that control the local concentration of NGF. The basal production of NGF in the tissue is enhanced and a variety of cell types is induced to synthesize NGF in response to inflammatory cytokines (i.e. IL-1 beta, TNF-alpha, IL-6), prostaglandins and histamine. In fact, both IL-1beta and TNF-alpha can induce the synthesis of NGF in neurons [50,51], Schwann cells , astrocytes , microglia , enteric glial cells , epithelial cells , fibroblasts [57,58], mesangial cells , smooth muscles , adipocytes [61,62], sinoviocytes [63,64], keratinocytes  and endothelial cells [66,67]. Similar induction of NGF production in many cell types has been demonstrated in vitro using IL-6 [68-70]. Other inflammatory mediators such as prostaglandins [71,72] and histamine  have also been shown in vitro to induce NGF production in certain cell types. In addition, immune cells involved in innate and acquired immunity show a basal expression of NGF, whose synthesis is dynamically regulated and enhanced in activated cells after stimulation with specific antigens and cytokines [74-78]. Activation of NF-kappaB pathways seems to play a pivotal role in regulating NGF expression in B lymphocytes . Since the endogenous levels of NGF are substantially increased in the inflamed tissues, it is not surprising that during the inflammatory process the innervation of these tissues is not static . Inflammation induces marked alterations in nerve fiber distribution and influences the phenotype of innervating neurons inducing the expression of neurotransmitters, neuromodulators, ion channels, G protein-coupled receptors and growth-associated structural proteins [80,81]. During inflammation the neuronal phenotype can even be modified, altering the amount or type of neurotransmitters produced and stored in nerve terminals. Afferent nerves that normally do not express tachykinins are induced to synthesize and use these neuropeptides . Peripheral inflammation leads to an increased sensitivity to pain: the properties of the somatosensory neurons change so that the pain threshold decreases, noxious stimuli evoke more acute and prolonged pain (hyperalgesia) and normally innocuous stimuli became painful (allodynia). This peripheral sensitization increases the firing of nociceptors and the intense stimulation induces the release from nerve endings of neuropeptides that can influence a variety of immune cell functions. One of the best-known neuroimmune mechanisms involving sensory neuropeptides is a phenomenon known as neurogenic inflammation: the release of neuropeptides by sensory nerves induces vasodilatation, plasma extravasation, promotes leukocyte chemotaxis and phagocytosis , and directly affects the release of inflammatory mediators from immune cells such as mast cells and macrophages . In the mucosae and in lymphoid organs, sensory fibers are in close contact with the cell membranes of keratinocytes, mast cells, macrophages, Langherans cells and endothelial cells in what has been defined a “neuroimmune junction” . The release of neuropeptides from nerve endings induces in these cells synthesis of inflammatory mediators and cytokines, and affects their functions. While SP has a clearly demonstrated pro-inflammatory role , CGRP, which is often co-localized with SP in nerve endings, can also have an inhibitory action. CGRP is a potent inhibitor of mitogen and antigen-stimulated proliferation of T-cells , antigen presentation by antigen presenting cells  and cytokine synthesis . The localized increased production of NGF in inflammatory conditions is considered to have a central role in the induction of hypersensitivity and inflammatory pain [89-91]. In vivo studies have shown that during the inflammatory process the localized increase in NGF induces modification of gene expression in dorsal root ganglia that can be prevented using anti-NGF antibodies . The neuronal phenotypic changes produced by NGF during inflammation include elevation of neuropeptides which amplify sensory input signals in the spinal cord and augment neurogenic inflammation in the periphery. NGF changes excitability of the neurons by increasing the expression of transmitters and tachykinins , receptors such as the capsaicin receptor TRPV1 [94,95], sensory neuron specific sodium channels , and by upregulating growth-related molecules which promote terminal sprouting and lead to a hyper-innervation of injured tissue [97-99]. The release from sensory nerve endings of neuropeptides, which affect immune cell functions, represents a direct means for the nervous system to regulate immune response. Since NGF directly induces the expression of neuropeptides and neurotransmitters in peripheral neurons, by directly acting on their promoters or neurotransmitter-producing enzymes. One of the possible mechanisms by which NGF may affect the immune response in a tissue is through the regulation of neurotransmitter and neuropeptide production. Studies of inflammatory disorders characterized by enhanced NGF production, abnormal activation of the immune system and increased production of cytokines, suggest that NGF can also be directly involved in regulating the immune response. This hypothesis has gained support from findings demonstrating the expression of the specific NGF receptors in lymphoid organs and in purified immune cell populations. The expression of NGF receptors has been found in primary (thymus, bursa of Fabricius, bone marrow) and secondary (spleen, tonsils, lymph nodes) lymphoid organs [100-102], and is raised during lymphocyte precursor migration but declines during post-natal life. NGF is also produced in primary lymphoid organs [100,103] and it is possible that NGF localized synthesis may contribute to create the micro-environment for the differentiation of hematopoietic stem cells [104,105]. In vitro NGF stimulates the functional activity of thymic epithelial cells inducing the expression of adhesion molecules important for thymocyte-thymic epithelia interaction and up-regulates the expression of thymopoietic factors such as IL-7, GM-CSF and SDF-1 . TrkA expression has been described in hematopoietic precursors  and NGF acts as a survival factor [108,109] and a colony-stimulating factor for human and murine myeloid progenitor cells, inducing basophil and mast cell differentiation [110-113]. Human CD34+ hematopoietic stem cells are characterized by an elevated expression of TrkA and by simultaneous expression and production of their own NGF . The expression of TrkA observed in hematopoietic precursors is maintained during lineage differentiation and mature immune cells express TrkA, albeit less abundantly. A gradient of TrkA and NGF expression exists with age and is highest in cord blood CD34+ cells, reduced in cord blood mononuclear cells and minimal in mononuclear cells isolated from adult peripheral blood . Changes in TrkA expression observed in immature and mature immune cells may indicate a different requirement for NGF, depending on the immune cell state of maturity and functional activity of these cells. NGF receptor expression has been studied in purified immune cell populations. TrkA expression has been demonstrated in mononuclear cells , thymocytes , human B and T lymphocytes [74, 75, 116,117 ], monocytes [77, 118], mast cells , basophils  and eosinophils . These cells have a basal expression of TrkA in resting condition, but after antigenic or mitogenic stimulation, when strong functional activity is necessary, they upregulate TrkA expression [74,75,77,117,118]. The discovery that the majority, if not all, of the immune cells express specific receptors for NGF and were potentially able to respond to it lent considerable impulse to studies of the influence of NGF on immune functions. After the first study demonstrating that the injection of NGF in newborn rats caused an increase in the number and size of mast cells , which was the earliest evidence of an effect of NGF on immune cells and outside the nervous system, numerous in vitro studies have shown that NGF is able to exert a wide spectrum of effects on immune cells (Figure 2). Figure 2. NGF effects on purified immune cell populations. The expression of TrkA, the specific receptor that mediates the biological activity of NGF, characterizes immune cells. The expression of TrkA observed in hemopoietic stem cells is maintained during lineage differentiation and in mature immune cells. 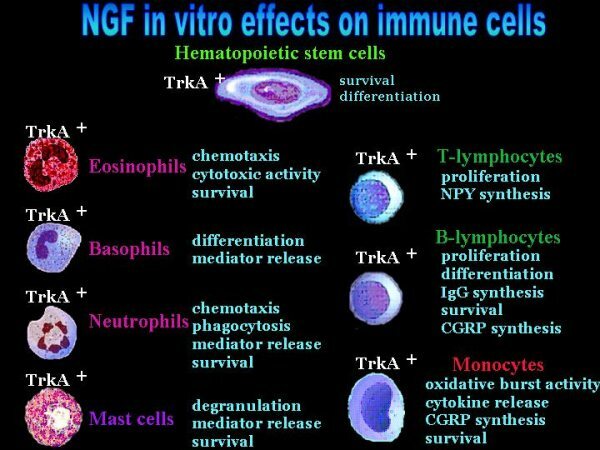 Due to the presence of TrkA, immune cells are potentially able to respond to NGF and a considerable number of in vitro studies have demonstrated numerous NGF effects on immune functions. An NGF effect that seems to be common to the majority of cell populations analyzed is its dose-dependent influence on the survival of hematopoietic stem cells and mature, differentiated cells [74,108,109, 123,124]. The viability-sustaining activity of NGF has been attributed to its effect on the induction of anti-apoptotic proteins such as Bcl-2. In general, in vitro studies on granulocytes and mast cells have shown that NGF can potentiate their responses to inflammatory stimuli, but its effects differ depending on the cell type analyzed. In activated basophils, NGF enhances the synthesis of lipid mediators (leukotrienes) in response to inflammatory stimuli [125,126], and together with IL-3 and IL-33, acts as cofactor to induce the release of histamine and enhance the response to IgE in both basophils and mast cells [127-131]. In immature mast cells NGF causes a dose-dependent up-regulation of tryptase and IgE receptors . In mature mast cells the addition of NGF after stimulation with lysophosphatidylserine induces and enhances cyclooxygenase2 (COX2) expression and the generation of prostaglandin D2 . NGF synergizes with lipopolysaccharide (LPS) for the induction of IL-6 and this effect is abolished by COX2 inhibitors . It has been reported that NGF alone can enhance mRNA expression in mast cells for IL-1alpha, IL-1beta, IL-6 and IL-10, but this could be a result of cellular stress during the isolation procedure because the effect was abolished after pre-incubation in complete medium before the addition of NGF . In contrast to its effect on basophils, NGF tends to suppress leukotriene formation in eosinophils . However, NGF seems to stimulate the production of IL-4 , influences the release of eosinophils peroxidase and enhances cytotoxic activity . As for mast cells [123,124], NGF also enhances, in a dose-dependent way, survival also of eosinophils  and neutrophils  by suppressing apoptosis, an effect abolished by anti-NGF antibody treatment. In neutrophils, in addition to its survival effect, NGF enhances superoxide production after cell activation with zymosan and stimulates phagocytosis . After preliminary studies in the 80s’ that showed that NGF was a chemoattractant factor for granulocytes [137,138], more recent studies have shown that mast cells , eosinophils and neutrophils [140,141] are influenced by the presence of NGF at the site of inflammation. This effect does not seem to be a direct one, but is probably regulated by neuropeptides and other mediators. In the bronchoalveolar lavage fluid of transgenic mice overexpressing NGF in the lungs, there is an increased number of eosinophils and IL-5 concentration after allergen sensitization and challenge. This difference between transgenic and wild type mice was completely abolished using receptor antagonists of Substance P and Neurokinin A receptors . Local administration of NGF in rat skin induced neutrophil accumulation and this appears to be mediated by NGF induction of adhesion molecules (i.e. ICAM-1) in endothelial cells . The use of anti-ICAM-1 antibodies blocked neutrophil accumulation in NGF-treated skin, suggesting that NGF has primarily an activating effect on endothelial cells, resulting in the accumulation of neutrophils . Abnormally decreased migration of neutrophils has been reported in patients with congenital insensitivity to pain with anhidrosis (CIPA), a rare genetic disease characterized by mutation of the TrkA gene . All these data suggest that the presence of NGF is pivotal to cell recruitment at the inflammation site, though the mechanisms and mediators involved still remain to be clarified. The studies on NGF effects on lymphocytes have shown that NGF is able to potentiate the proliferative response of B and T-cells to several mitogens . The NGF dose-dependent increase in DNA synthesis is inhibited by anti-NGF antibodies. The addition of NGF induces interleukin-2 receptors in mature lymphoid cells and the proliferative response is augmented in B-cells when NGF is added together with IL-2 . Although CD4+ lymphocytes also express TrkA receptors , few data on these cells are available, while more numerous studies have focused on B lymphocytes. B-cells express TrkA  and the binding of NGF to this receptor activates intracellular pathways and nuclear factors in a manner similar to that described in neurons [145-147]. Abolition of TrkA function in knock out mice models  or in CIPA patients results in altered differentiation and survival of B lymphocytes . Different studies using B cells obtained from healthy controls or animal models stimulated with a variety of stimuli, with or without the presence of T cells, have shown that NGF can influence the production of IgM and IgG (especially IgG4) [150,151]. Altogether these results support the conclusion that NGF stimulates B cell immune responses. However, it has also been reported that NGF and anti-CD40 decrease immunoglobulin secretion in a dose-dependent manner [152,153]. Moreover, in mice selectively lacking TrkA expression in non-neuronal tissues, increased IgM, IgG1 and IgG2 levels have been described . These data are in contrast with those described above and with the findings showing that NGF is a survival factor for memory B cells , promotes the differentiation of B-cells into immunoglobulin-secreting plasma cells  and influences plasma cell survival . These evident contradictions lend support to the conclusion that a clear understanding of the physiological and pathological role of NGF on B cells is still lacking. Monocytes and macrophages express TrkA and p75NTR, while differentiated dendritic cells lose TrkA and maintain only p75NTR expression [77,118,155]. All these cells enhance [77,118] or re-express TrkA  in the presence of inflammatory stimuli (i.e. classically LPS). NGF protects monocytes from apoptosis induced by UVB radiation or gliotoxin, by inducing the expression of anti-apoptotic proteins Bcl-2, Bcl-xl and Bfl-1 . In vitro migratory properties are affected: in macrophages, NGF increases CXCR4 expression and chemotactic response to sub-optimal CXCL-12 concentration . Inflammatory macrophages isolated from the peritoneum after stimulation and then treated with NGF show an increase in phagocytosis, an enhanced parasite-killing activity and an induction of IL-1beta . NGF can also induce TNF-alpha secretion and a modest increase in nitric oxide (NO) production in macrophages , but this latter effect is strongly amplified when cells are pre-treated with interferon-gamma. NGF addition promotes LPS-induced maturation of dendritic cells and induced secretion of inflammatory cytokines . Dendritic cells derived from allergic donors and stimulated with LPS and CD40 ligand produce more IL-6 in response to NGF while the effect of NGF on dendritic cells generated from healthy donors is to induce more IL-10 production . Consistent with this finding is the fact that NGF deprivation in LPS-treated monocytes significantly decreases IL-10 synthesis . In addition to the induction of inflammatory mediators and cytokines, NGF can also induce in immune cells the synthesis of neuropeptides with immunomodulatory functions. Similarly to its effect on neuronal cells, NGF can induce NPY expression in T lymphocytes  and regulates the expression and release of CGRP in human B lymphocytes  and monocytes [160,163]. The synthesis of CGRP is enhanced after LPS stimulation and this up-regulation is abolished when NGF is neutralized . The binding of CGRP to its specific receptors on monocytes activates a cAMP-PKA pathway that inhibits pro-inflammatory cytokine synthesis  and up-regulates production of IL-10 in LPS-stimulated cells. Using CGRP receptor antagonists in LPS-treated monocytes, the expression of membrane molecules involved in antigen presentation, such as HLA-DR and CD86, is increased . By inducing CGRP and IL-10 production, NGF can reduce the antigen-presenting capacity and co-stimulatory function of monocytes and may contribute to the down-regulation of T-cell responses. These data suggest that at least some of the NGF effects described until now are not directly dependent on NGF itself, but rather are regulated by intermediate mediators whose synthesis is under NGF control. There are already numerous data available suggesting that neuropeptides such as SP, CGRP, NPY, and VIP, whose synthesis is induced by NGF in neurons and probably in many more immune cells than we are currently aware of, play a key role in regulating inflammatory and anti-inflammatory responses and in maintaining homeostasis [85,165-167]. From the in vitro data it can be concluded that NGF maintains immune cells in a “state of alert” to potential danger signals. Indeed, the in vitro data show that NGF helps to mount a faster and stronger inflammatory response. NGF by itself does not seem to induce inflammatory and immune responses efficiently but in the presence of specific stimuli, it enhances mediator release and cytokine production and activates functions of innate immune cells. However, at present some of the data obtained in vivo are not consistent with this conclusion, and the role of NGF in vivo is rather different from what might have been expected from in vitro studies. As will be shown in the next paragraph, the reason why NGF production is increased during inflammation and how this enhanced concentration affects the immune and inflammatory responses are far from being understood. The idea that NGF plays a much more complex role and may be involved in multiple mechanisms regulating the immune response has emerged from studies on experimental models of EAE. In marmoset EAE, intraventricular administration of NGF one week after disease induction with myelin oligodendrocyte glycoprotein (MOG) immunization, delays the onset of clinical EAE and prevents the full development of histological lesions in the central nervous system (CNS). In the brain of NGF-treated animals, the number and size of inflammatory infiltrates are reduced and demyelination is minimal . The production of interferon-gamma by the T-cells infiltrating the brain is reduced, while production of IL-10 is enhanced in NGF-treated animals . Similar results were obtained in a murine EAE model. Intraperitoneal injections of NGF starting one day after immunization with myelin basic protein (MBP) or after adoptive transfer of encephalitogenic T-cells led to a delayed onset, decreased clinical signs of the disease and enhanced survival of the animals . In a T-cell transfer model of EAE, myelin basic protein-specific CD4+ T-cell clones were transduced with recombinant retrovirus encoding for NGF and used to induce EAE in rats . These MBP clones producing NGF did not induce EAE although the transduction did not affect cytokine production or antigen reactivity. When the pathogenetic wild-type MBP clones were injected together with the NGF-transfected clones, the rats developed a very mild disease with no or only minor clinical signs . Analysis of the brains showed a reduction in inflammatory cells crossing the endothelial brain-blood barrier (BBB), with the number of activated macrophages being especially decreased. In a co-culture system with monocytes and endothelial BBB, the addition of NGF interfered with monocyte migration through the activated endothelium . Complementary effects are observed in an EAE rat model, in which NGF deprivation results in an exacerbated brain inflammation and more severe clinical signs . The data obtained in different EAE models thus support an anti-inflammatory role of NGF in CNS immune-mediated inflammation. In these models the administration of NGF seems to exert its effects directly on immune cell activity: inhibition of monocyte migration and antigen presentation, altered T-helper balance, down-regulation of IFN-gamma synthesis and up-regulation of the anti-inflammatory cytokine IL-10 (Figure 3). Figure 3. Possible mechanisms for NGF in vivo anti-inflammatory action. Administration of NGF in experimental models of inflammation inhibits monocyte migration and antigen presentation, alters T-helper balance and down-regulates IFN-γ. Some of these NGF effects can be mediated by IL-10 and CGRP. 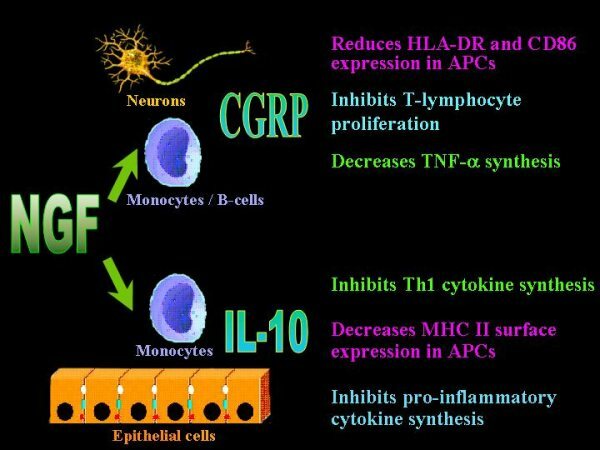 NGF induces the synthesis of the anti-inflammatory cytokine IL-10 in immune and epithelial cells and the expression of CGRP in peripheral neurons and antigen presenting cells. Both IL-10 and CGRP can dampen the immune response essentially by affecting antigen presentation in APCs, reducing T-lymphocytes proliferation and inflammatory cytokine synthesis. Thus, the reported enhancement of NGF in inflammatory diseases might represent a physiological mechanism activated for fine-tuning anti-inflammatory responses. Similarly, in experimental models of colitis it has been shown that NGF production remains elevated in the tissue until colon inflammation subsides . Neutralization of NGF by pre-treatment with anti-NGF antibodies before the induction of colitis causes a significant increase in the severity of clinical signs with more extended lesions and ulcers, together with an increase in the number of infiltrating neutrophils and macrophages . Also in this experimental model, the increase in NGF correlates with the enhancement of IL-10 , possibly because intestinal epithelial cells NGF and IL-10 are able to regulate each other’s expression , as shown in vitro. In addition to the induction of the anti-inflammatory cytokine IL-10, a number of observations point to the involvement of other mechanisms in the in vivo anti-inflammatory effects of NGF. In the colitis model, enhanced tissue inflammation caused by NGF neutralization is associated with a marked reduction in CGRP content in the gut . Moreover, the ablation of sensory fibers results in a marked severity of inflammation in acute and chronic models of experimental colitis and in both cases the decrease in CGRP content or its inhibition in the colon using CGRP receptor antagonist aggravates experimental colitis . Functional sensory neurons and their neuropeptides (i.e. CGRP) are probably involved in the in vivo action of NGF. The endogenous NGF produced in vivo at the site of inflammation thus represents a critical link between nervous and immune cells. This hypothesis is supported by studies on a mouse model in which the animal’s skin received Ultraviolet B (UVB) irradiation. UVB, as well as causing edema and erythema, induces systemic suppression of contact hypersensitivity (CHS) responses and NGF, together with nerves and neuropeptides, seems to play a relevant role in this phenomenon. In mouse epidermis, UVB irradiation up-regulates NGF expression, which peaks after 12 hours . Anti-NGF antibodies administered prior to UVB irradiation abrogate the systemic suppression of CHS in mice . Similarly, in normal mice, the CHS response was inhibited by NGF pre-treatment of the skin before trinitrochlorobenzene (TNCB) sensitization . Moreover, when mice were treated with capsaicin, which depletes nerve endings of sensory neuropeptides, pre-incubation with NGF was not effective in suppressing CHS response . Also in this model NGF-induced synthesis of CGRP seems to represent a key mediator for the control of immune cell activity and for balancing pro- and anti-inflammatory responses. In UV-induced tolerance, the induction of CGRP synthesis in cutaneous sensory C-fibers after UV radiation  is regulated by keratinocyte-derived NGF . In vivo CGRP administration dampens the immune response essentially by affecting antigen presentation in a variety of antigen-presenting cells (APCs) [86, 87,180,181]. This inhibitory activity of CGRP seems to be mediated through inhibition of the NF-kappaB pathway  and a rapid up-regulation of inducible cAMP early repressor (ICER) [164,183], which causes premature repression of inflammation-induced transcriptional activity. Thus, the ability of NGF in vivo to regulate production and release of sensory neuropeptides seems to be a key factor not only in keeping the defense system active (i.e. through SP) but also in activating inhibitory pathways that limit inflammation. Indeed, there is an increasing volume of data from in vivo models of inflammation showing that integrity of the peripheral nervous system is essential for the activation of an anti-inflammatory feedback circuit [184-188]. A typical example of nerve damage leading to uncontrolled tissue inflammation is given by cutaneous infections and altered immune responses in diabetes. In both humans and animal models of drug-induced diabetes, impaired production of NGF is responsible for the reduction in cutaneous innervation. In animal models, the exogenous administration of NGF, while improving nerve functions and restoring innervation in the skin , normalizes the diabetes-impaired response to wound healing by decreasing neutrophil accumulation and increasing re-epithelialization and matrix density . Recent data obtained in transgenic mice overexpressing NGF indicate that these animals, while having increased number of nociceptors in the skin, display reduced hypersensitivity and recover more rapidly in response to inflammation . In conclusion, the in vitro and in vivo data on the role of NGF on immune and inflammatory responses are in apparent contradiction. In vitro data suggest that NGF potentiates immune and inflammatory responses (particularly in innate immune cells), leading to the hypothesis that NGF contributes to maintain an “alert” state of the immune system. On the other hand, the marked increase in NGF production in inflammatory conditions (both in humans and animals), and in animal models of inflammatory disease, appears to have an anti-inflammatory, immunosuppressive function. This effect appears to be mediated by a direct action on immune cells (reduced migration and antigen presentation and increased production of IL-10) or indirectly by inducing production of neurotransmitters and neuropeptides. The increase in NGF production at inflammatory sites may, therefore, represent an effort to avoid excessive host inflammation and to restore homeostasis. We still need to reconcile these in vivo effects with the in vitro data. It is certainly possible that studies based only on in vitro approaches might underestimate the complexity of the interactions of mechanisms operated in vivo by NGF. However, the in vivo data described here were all obtained from animal models of diseases that do not reflect a physiological condition. Since NGF is constitutively produced in all tissues in ‘steady state’ conditions, there is a need for in vivo studies to address the possible role of NGF in immune cells in the absence of inflammation. Taking all the available data together, it is tempting to hypothesize that during normal conditions, NGF might represent one of the signals that keeps the immune system “on guard” but when the immune system is activated and tissue damage occurs, increased NGF may provide a regulatory feed-back signal. A dual role of NGF depending on the state of the organism might therefore be envisioned. However, the molecular mechanisms and the different mediators involved in these “dual” effects need to be identified. This is of particular relevance in the light of possible pharmacological manipulation of NGF in disease states. The author wishes to thank Dr. Fabrizio de Benedetti and Prof. Maria Egle de Stefano for their suggestions and critical reading of the manuscript. This review is dedicated with friendship and gratitude to Prof. Rita Levi-Montalcini and Prof. Thomas Lundeberg for sharing over the years their physiological and integrative vision of NGF. Sternberg EM. Neural regulation of innate immunity: a coordinated nonspecific host response to pathogens. Nat Rev Immunol. 2006; 6:318-28. Madden KS and Felten DL. Experimental basis for neuronal-immune interactions. Physiol Rev 1995, 75:77-106. Elenkov IJ, Wilder RL, Chrousos GP, Vizi ES.The sympathetic nerve–an integrative interface between two supersystems: the brain and the immune system. Pharmacol Rev. 2000;52:595-638. Kohm AP, Sanders VM. Norepinephrine and beta 2-adrenergic receptor stimulation regulate CD4+ T and B lymphocyte function in vitro and in vivo. Pharmacol Rev. 2001;53: 487-525. Straub RH. Complexity of the bi-directional neuroimmune junction in the spleen. Trends Pharmacol Sci. 2004;25:640-6. Wrona D. Neural-immune interactions: an integrative view of the bidirectional relationship between the brain and immune systems. J Neuroimmunol. 2006; 172:38-58. Shepherd AJ, Downing JEW, Miyan JA. Without nerves, immunology remains incomplete -in vivo veritas. Immunology. 2005;116:145-63. Tracey KJ. Reflex control of immunity. Nat Rev Immunol. 2009;9:418-28. Ebendal T. Function and evolution in the NGF family and its receptors. J.Neurosci. 1992; 32:461-470. Götz R, Schartl M. The conservation of neurotrophic factors during vertebrate evolution. Comp Biochem Physiol Pharmacol Toxicol Endocrinol. 1994;108:1-10. Hallböök F. Evolution of the vertebrate neurotrophin and Trk receptor gene families.Curr Opin Neurobiol. 1999;9:616-21. Chao MV, Hempstead BL. p75 and Trk: a two-receptor system. Trends Neurosci. 1995;18:321-6. Reichardt LF. Neurotrophin-regulated signalling pathways. Philos Trans R Soc Lond B Biol Sci. 2006; 361:1545-64. Levi-Montalcini R. The nerve growth factor 35 years later. Science 1987; 237: 1154-1162. Crowley C, Spencer SD, Nishimura MC, Chen K S, Pitts-Meek S, Armanini M., Ling LH, McMahon S B, Shelton DL, Levinson AD, Phillips HS. Mice lacking nerve growth factor display perinatal loss of sensory and sympathetic neurons yet develop basal forebrain cholinergic neurons. Cell 1994; 76: 1001-1011. Silos-Santiago I, Molliver DC, Ozaki S, Smeyne RJ, Fagan AM, Barbacid M, Snider WD. Non-TrkA-expressing small DRG neurons are lost in TrkA deficient mice. J Neurosci. 1995 ;15:5929-42. Fagan AM, Zhang H, Landis S, Smeyne RJ, Silos-Santiago I, Barbacid M.TrkA, but not TrkC, receptors are essential for survival of sympathetic neurons in vivo. J Neurosci. 1996;16:6208-18. Conover J, Yancopoulos GD. Neurotrophin regulation of the developing nervous system: analyses of Knockout mice. Rev Neurosci 1997; 8: 13-27. Otten U, Schwab M, Gagnon C, Thoenen H. Selective induction of tyrosine hydroxylase and dopamine beta-hydroxylase by nerve growth factor: comparison between adrenal medulla and sympathetic ganglia of adult and newborn rats. Brain Res. 1977;133:291-303. Goedert M, Stoeckel K, Otten U. Biological importance of the retrograde transport of nerve growth factor in sensory neurons. Proc Natl Acad Sci USA 1981; 78: 5895-5898. Lindsay RM, Harmar AJ. Nerve growth factor regulates expression of neuropeptide genes in adult sensory neurones. Nature 1989; 337: 362-364. Verge VMK, Richardson PM, Wiesenfeld-Hallin Z, Hokfelt T. Differential influence of nerve growth factor on neuropeptide expression in vivo: a novel role in peptide suppression in adult sensory neurons. J Neurosci 1995; 15: 2081-2096. Mearow KM.The effects of NGF and sensory nerve stimulation on collateral sprouting and gene expression in adult sensory neurons. Exp Neurol. 1998;151:14-25. Lombardi L, De Stefano ME, Paggi P. Components of the NGF signaling complex are altered in mdx mouse superior cervical ganglion and its target organs. Neurobiol Dis. 2008; 32:402-11. Sofroniew MV, Howe CL, Mobley WC. Nerve growth factor signaling,neuroprotection, and neural repair. Annu Rev Neurosci. 2001;24:1217-81. Ernsberger U. Role of neurotrophin signalling in the differentiation of neurons from dorsal root ganglia and sympathetic ganglia. Cell Tissue Res. 2009;336:349-84. Albers KM, Wright DE, Davis BM. Overexpression of nerve growth factor in epidermis of transgenic mice causes hypertrophy of the peripheral nervous system. J Neurosci. 1994;14:1422-32. Stucky CL, Koltzenburg M, Schneider M, Engle MG, Albers KM, Davis BM. Overexpression of nerve growth factor in skin selectively affects the survival and functional properties of nociceptors. J Neurosci. 1999;19:8509-16. Hoyle GW, Graham RM, Finkelstein JB, Nguyen KP, Gozal D, Friedman M. Hyperinnervation of the airways in transgenic mice overexpressing nerve growth factor. Am J Respir Cell Mol Biol. 1998;18:149-57. Carlson SL, Albers KM, Beiting DJ, Parish M, Conner JM, Davis BM. NGF modulates sympathetic innervation of lymphoid tissues. J Neurosci. 1995;15:5892-9. Bracci-Laudiero L, Aloe L, Levi-Montalcini R, Buttinelli C, Schilter D, Gillessen S, and Otten U. Multiple sclerosis patients express increased levels of b-nerve growth factor in cerebrospinal fluid. Neurosci Lett 1992; 147: 9-12. Aloe L, Tuveri MA, Carcassi U, Levi-Montalcini R. Nerve growth factor in the synovial fluid of patients with chronic arthritis. Arth Rheum 1992; 35: 351-355. Bracci-Laudiero L, Aloe L, Levi-Montalcini R, Galeazzi M, Schilter D, Scully JL, and Otten U. Increased levels of NGF in sera of systemic lupus erythematosus patients. NeuroReport 1993; 4: 563-565. Aalto K, Korhonen L, Lahdenne P, Pelkonen P, Lindholm D. Nerve growth factor in serum of children with systemic lupus erythematosus is correlated with disease activity. Cytokine. 2002; 20:136-9. Safieh-Garabedian B, Poole S, Allchorne A, Winter J, Woolf CJ. Contribution of interleukin-1 beta to the inflammation-induced increase in nerve growth factor levels and inflammatory hyperalgesia. Br J Pharmacol. 1995;115:1265-75. Manni L, Aloe L.Role of IL-1 beta and TNF-alpha in the regulation of NGF in experimentally induced arthritis in mice. Rheumatol Int. 1998;18:97-102. Bracci-Laudiero L, Lundeberg T, Stenfors C, Theodorsson E, Tirassa P, Aloe L. Modification of lymphoid and brain nerve growth factor levels in systemic lupus erythematosus mice. Neurosci Lett. 1996;204:13-6. De Simone R, Micera A, Tirassa P, Aloe L. mRNA for NGF and p75 in the central nervous system of rats affected by experimental allergic encephalomyelitis. Neuropathol Appl Neurobiol. 1996; 22:54-9. Seidel MF, Herguijuela M, Forkert R, Otten U. Nerve Growth Factor in Rheumatic Diseases. Semin Arthritis Rheum. 2010; in press. Lowe EM, Anand P, Terenghi G, Williams-Chestnut RE, Sinicropi DV, Osborne JL. Increased nerve growth factor levels in the urinary bladder of women with idiopathic sensory urgency and interstitial cystitis. Br J Urol. 1997;79:572-7. Jacobs BL, Smaldone MC, Tyagi V, Philips BJ, Jackman SV, Leng WW, Tyagi P. Increased nerve growth factor in neurogenic overactive bladder and interstitial cystitis patients. Can J Urol. 2010; 17:4989-94. Bonini S, Lambiase A, Bonini S, Angelucci F, Magrini L, Manni L, Aloe L. Circulating nerve growth factor levels are increased in humans with allergic diseases and asthma. Proc Natl Acad Sci U S A. 1996 1;93:10955-60. Braun A, Appel E, Baruch R, Herz U, Botchkarev V, Paus R, Brodie C, Renz H. Role of nerve growth factor in a mouse model of allergic airway inflammation and asthma. Eur J Immunol. 1998;28:3240-51. Lambiase A, Bonini S, Bonini S, Micera A, Magrini L, Bracci-Laudiero L, Aloe L. Increased plasma levels of nerve growth factor in vernal keratoconjunctivitis and relationship to conjunctival mast cells. Invest Ophthalmol Vis Sci. 1995;36:2127-32.
di Mola FF, Friess H, Zhu ZW, Koliopanos A, Bley T, Di Sebastiano P, Innocenti P, Zimmermann A, Büchler MW. Nerve growth factor and Trk high affinity receptor (TrkA) gene expression in inflammatory bowel disease. Gut. 2000;46:670-9. Stanzel RD, Lourenssen S, Blennerhassett MG. Inflammation causes expression of NGF in epithelial cells of the rat colon. Exp Neurol. 2008;211:203-13. Fantini F, Magnoni C, Bracci-Laudiero L, Pincelli C TE. Nerve growth factor is increased in psoriatic skin. J Invest Dermatol. 1995 ;105:854-5. Raychaudhuri SP, Jiang WY, Farber EM. Psoriatic keratinocytes express high levels of nerve growth factor. Acta Derm Venereol. 1998;78:84-6. Toyoda M, Nakamura M, Makino T, Hino T, Kagoura M, Morohashi M. Nerve growth factor and substance P are useful plasma markers of disease activity in atopic dermatitis. Br J Dermatol. 2002; 147:71-9. Friedman WJ, Larkfors L, Ayer-LeLievre C, Ebendal T, Olson L, Persson H. Regulation of b-nerve growth factor expression by inflammatory mediators in hippocampal cultures. J Neurosci Res 1990; 27: 374-382. Bandtlow CE, Meyer M, Lindholm D, Spranger M, Heumann R, Thoenen H. Regional and cellular codistribution of interleukin 1 beta and nerve growth factor mRNA in the adult rat brain: possible relationship to the regulation of nerve growth factor synthesis. J Cell Biol. 1990;111:1701-11. Lindholm D, Heumann R, Meyer M, Thoenen H. Interleukin-1 regulates synthesis of nerve growth factor in non-neuronal cells of rat sciatic nerve. Nature 1987; 330: 658-659. Gadient RA, Cron KC, Otten U. Interleukin-1b and tumor necrosis factor-a synergistically stimulate nerve growth factor (NGF) release from cultured rat astrocytes. Neurosci Lett 1990; 117: 335-340. Heese K, Hock C, Otten U. Inflammatory signals induce neurotrophin expression in human microglial cells. J Neurochem. 1998;70:699-707.
von Boyen GB, Steinkamp M, Reinshagen M, Schäfer KH, Adler G, Kirsch J. Nerve growth factor secretion in cultured enteric glia cells is modulated by proinflammatory cytokines.J Neuroendocrinol. 2006;18:820-5. Fox AJ, Patel HJ, Barnes PJ, Belvisi MG. Release of nerve growth factor by human pulmonary epithelial cells: role in airway inflammatory diseases. Eur J Pharmacol. 2001;424:159-62. Hattori A, Iwasaki S, Murase K, Tsujimoto M, Sato M, Hayashi K, Kohno M. Tumor necrosis factor is markedly synergistic with interleukin 1 and interferon-gamma in stimulating the production of nerve growth factor in fibroblasts. FEBS Lett. 1994;340:177-80. Olgart C, Frossard N. Human lung fibroblasts secrete nerve growth factor: effect of inflammatory cytokines and glucocorticoids. Eur Respir J. 2001;18:115-21. Steiner P, Pfeilschifter J, Boeckh C, Radeke H, Otten U. Interleukin-1 beta and tumor necrosis factor-alpha synergistically stimulate nerve growth factor synthesis in rat mesangial cells. Am J Physiol. 1991;261:F792-8. Freund V, Pons F, Joly V, Mathieu E, Martinet N, Frossard N. Upregulation of nerve growth factor expression by human airway smooth muscle cells in inflammatory conditions. Eur Respir J. 2002 ; 20:458-63. Wang B, Jenkins JR, Trayhurn P.Expression and secretion of inflammation-related adipokines by human adipocytes differentiated in culture: integrated response to TNF-alpha. Am J Physiol Endocrinol Metab. 2005;288:E731-40. Ryan VH, German AJ, Wood IS, Hunter L, Morris P, Trayhurn P. NGF gene expression and secretion by canine adipocytes in primary culture: upregulation by the inflammatory mediators LPS and TNFalpha. Horm Metab Res. 2008;40:861-8. Manni L, Lundeberg T, Fiorito S, Bonini S, Vigneti E, Aloe L. Nerve growth factor release by human synovial fibroblasts prior to and following exposure to tumor necrosis factor-alpha, interleukin-1 beta and cholecystokinin-8: the possible role of NGF in the inflammatory response. Clin Exp Rheumatol. 2003;21:617-24. Raychaudhuri SP, Raychaudhuri SK. The regulatory role of nerve growth factor and its receptor system in fibroblast-like synovial cells. Scand J Rheumatol. 2009;38:207-15. Takaoka K, Shirai Y, Saito N. Inflammatory cytokine tumor necrosis factor-alpha enhances nerve growth factor production in human keratinocytes, HaCaT cells. J Pharmacol Sci. 2009;111:381-91. Tanaka A, Wakita U, Kambe N, Iwasaki T, Matsuda H. An autocrine function of nerve growth factor for cell cycle regulation of vascular endothelial cells. Biochem Biophys Res Commun. 2004;313:1009-14. Moser KV, Reindl M, Blasig I, Humpel C.Brain capillary endothelial cells proliferate in response to NGF, express NGF receptors and secrete NGF after inflammation. Brain Res. 2004;1017:53-60. Frei K, Malipiero UV, Leist T, Zinkernagel RM, Schwab ME and Fontana A. On the cellular source and function of interleukin 6 produced in the central nervous system in viral disease. Eur J Immunol.1989;19: 689-694. Kossmann T, Hans V, Imhof HG, Trentz O, Morganti-Kossmann MC. Interleukin-6 released in human cerebrospinal fluid following traumatic brain injury may trigger nerve growth factor production in astrocytes. Brain Res. 1996;713:143-52. März P, Heese K, Dimitriades-Schmutz B, Rose-John S, Otten U. Role of interleukin-6 and soluble IL-6 receptor in region-specific induction of astrocytic differentiation and neurotrophin expression. Glia. 1999;26:191-200. Bulló M, Peeraully MR, Trayhurn P. Stimulation of NGF expression and secretion in 3T3-L1 adipocytes by prostaglandins PGD2, PGJ2, and Delta12-PGJ2. Am J Physiol Endocrinol Metab. 2005 ;289:E62-7. Toyomoto M, Ohta M, Okumura K, Yano H, Matsumoto K, Inoue S, Hayashi K, Ikeda K. Prostaglandins are powerful inducers of NGF and BDNF production in mouse astrocyte cultures. FEBS Lett. 2004 26;562:211-5. Lipnik-Stangelj M, Carman-Krzan M. Activation of histamine H1-receptor enhances neurotrophic factor secretion from cultured astrocytes. Inflamm Res. 2004; 53:245-52. Cozzolino F, Aloe L, Garaci E. Nerve growth factor is an autocrine survival factor for memory B lymphocytes. Cell. 1996;85:345-56. Lambiase A, Bracci-Laudiero L, Bonini Se, Bonini St, Starace G, D”Elios MM, De Carli M, Aloe L. Human CD 4+ T-clones produce and release nerve growth factor and express TrkA. J Allergy Clin Immunol.1997;100:408-414. Xiang Z, Nilsson G. IgE receptor-mediated release of nerve growth factor by mast cells. Clin Exp Allergy. 2000;30:1379-86. Caroleo MC, Costa N, Bracci-Laudiero L, Aloe L. Human monocyte/macrophages activate by exposure to LPS overexpress NGF and NGF receptors. J Neuroimmunol. 2001;113:193-201. Kobayashi H, Gleich GJ, Butterfield JH, Kita H. Human eosinophils produce neurotrophins and secrete nerve growth factor on immunologic stimuli. Blood. 2002;99:2214-20. Carr MJ, Undem BJ Inflammation-induced plasticity of the afferent innervation of the airways. Environ Health Perspect. 2001;109:567-71. Woolf CJ, Salter MW.Neuronal plasticity: increasing the gain in pain. Science. 2000; 288:1765-9. Fischer A, McGregor G, Saria A, Philippin B and Kummer W. Induction of tachykinin gene and peptide expression in guinea pig nodose primary afferent neurons by allergic airway inflammation, J Clin Invest 1996; 98: 2284–2291. Zegarska B, Lelińska A, Tyrakowski T. Clinical and experimental aspects of cutaneous neurogenic inflammation. Pharmacol Rep. 2006;58:13-21. Tore F, Tuncel N. Mast cells: target and source of neuropeptides. Curr Pharm Des. 2009;15:3433-45. O”Connor TM, O”Connell J, O”Brien DI, Goode T, Bredin CP, Shanahan F. The role of substance P in inflammatory disease. J Cell Physiol. 2004;201:167-80. Carucci JA, Ignatius R, Wei Y, Cypess AM, Schaer DA, Pope M, Steinman RM, Mojsov S.Calcitonin gene-related peptide decreases expression of HLA-DR and CD86 by human dendritic cells and dampens dendritic cell-driven T cell-proliferative responses via the type I calcitonin gene-related peptide receptor. J Immunol. 2000 ; 164:3494-9. Hosoi J, Murphy GF, Egan CL, Lerner EA, Grabbe S, Asahina A and Granstein RD. Regulation of Langherans cell function by nerves containing calcitonin gene-related peptide. Nature 1993; 363:159-163. Gomes RN, Castro-Faria-Neto HC, Bozza PT, Soares MB, Shoemaker CB, David JR, Bozza MT. Calcitonin gene-related peptide inhibits local acute inflammation and protects mice against lethal endotoxemia. Shock. 2005;24:590-4. Woolf CJ, Safieh-Garabedian B, Ma QP, Crilly P, Winter J. Nerve growth factor contributes to the generation of inflammatory sensory hypersensitivity. Neuroscience. 1994;62:327-31. Lewin GR, Mendell LM.Nerve growth factor and nociception. Trends Neurosci. 1993;16:353-9. Pezet S, McMahon SB. Neurotrophins: mediators and modulators of pain. Annu Rev Neurosci. 2006;29:507-38. Donnerer J, Schuligoi R, Stein C. Increased content and transport of substance P and calcitonin gene-related peptide in sensory nerves innervating inflamed tissue: evidence for a regulatory function of nerve growth factor in vivo. Neuroscience 1992; 49: 693-698. Galeazza MT, Garry MG, Yost HJ, Strait KA, Hargreaves KM, Seybold VS. Plasticity in the synthesis and storage of substance P and calcitonin gene-related peptide in primary afferent neurons during peripheral inflammation. Neuroscience. 1995;66:443-58. Ji RR, Samad TA, Jin SX, Schmoll R, Woolf CJ. p38 MAPK activation by NGF in primary sensory neurons after inflammation increases TRPV1 levels and maintains heat hyperalgesia. Neuron. 2002;36:57-68. Xue Q, Jong B, Chen T, Schumacher MA. Transcription of rat TRPV1 utilizes a dual promoter system that is positively regulated by nerve growth factor. J Neurochem. 2007;101:212-22. Fjell J, Cummins TR, Fried K, Black JA, Waxman SG. In vivo NGF deprivation reduces SNS expression and TTX-R sodium currents in IB4-negative DRG neurons. J Neurophysiol. 1999;81:803-10. Diamond J, Holmes M, Coughlin M. Endogenous NGF and nerve impulses regulate the collateral sprouting of sensory axons in the skin of the adult rat. J Neurosci. 1992;12:1454-66. Gölz G, Uhlmann L, Lüdecke D, Markgraf N, Nitsch R, Hendrix S.The cytokine/neurotrophin axis in peripheral axon outgrowth. Eur J Neurosci. 2006;24:2721-30. Kinkelin I, Mötzing S, Koltenzenburg M, Bröcker EB. Increase in NGF content and nerve fiber sprouting in human allergic contact eczema. Cell Tissue Res. 2000;302:31-7. Laurenzi MA, Barbany G, Timmusk T, Lindgren JA, Persson H. Expression of mRNA encoding neurotrophins and neurotrophin receptors in rat thymus, spleen tissue and immunocompetent cells Eur J Biochem 1994; 223:733-741. Ciriaco E, Dall’Aglio C, Hannestad J, Huerta JJ, Laurà R, Germanà G, Vega JA. Localization of TrK neurotrophin receptor-like proteins in avian primary lymphoid organs: thymus and bursa of Fabricius. J Neuroimmunol. 1996; 69: 73-83. Garcia-Suárez O, Germanà A, Hannestad J, Ciriaco E, Silos-Santiago I, Germanà G, Vega JA. Involvement of the NGF receptors (Trka and p75lngfr) in the development and maintenance of the thymus. Ital J Anat Embryol. 2001;106:279-85. Aloe L, Micera A, Bracci-Laudiero L, Vigneti E, Turrini P. Presence of nerve growth factor in the thymus of prenatal and pregnant rats. Thymus. 1997; 24:221-231. Pezzati P, Stanisz AM, Marshall JS, Bienenstock J, Stead RH. Expression of nerve growth factor receptor immunoreactivity on follicular dendritic cells from human mucosa associated lymphoid tissues. Immunol. 1992; 76:485-490. Cattoretti G, Schirò R, Orazi A, Soligo D and Colombo MP Bone marrow stroma in humans: anti-nerve growth factor receptor antibodies selectively stain reticular cells in vivo and in vitro. Blood 1993; 81: 1726-1738. Lee HW, Na YJ, Jung PK, Kim MN, Kim SM, Chung JS, Kim BS, Kim JB, Moon JO, Yoon S. Nerve growth factor stimulates proliferation, adhesion and thymopoietic cytokine expression in mouse thymic epithelial cells in vitro. Regul Pept. 2008;147:72-81. Chevalier S, Praloran V, Smith C, Mac Grogan D, Ip NY, Yancopoulos GD, Brachet P, Pouplard A, Gascan H. Expression and functionality of the trkA proto-oncogene product/NGF receptor in undifferentiated hematopoietic cells. Blood 1994; 83: 1479-1485. Bracci-Laudiero L, Vigneti E, Iannicola C, Aloe L. NGF retards apoptosis in chick embryo bursal cell in vitro. Differentiation 1993; 53: 61-66. Auffray I, Chevalier S, Froger J, Izac B, Vainchenker W, Gascan H, Coulombel L. Nerve growth factor is involved in the supportive effect by bone marrow derived stromal cells of the factor-dependent human cell line UT-7. Blood 1996; 88: 1608-1618. Matsuda H, Coughlin MD, Bienenstock J, Denburg JA. Nerve growth factor promotes human hemapoietic colony growth and differentiation; Proc Natl Acad Sci USA 1988; 85:6508-6512. Tsuda T, Wong D, Dolovich J, Bienenstock J, Marshall J, Denburg JA Synergistic effects of nerve growth factor and granulocytes-macrophage colony-stimulating factor on human basophilic cell differentiation. Blood 1991; 77:971-979. Matsuda H, Kannan Y, Ushio H, Kiso Y, Kanemoto T, Suzuki H, Kitamura Y. Nerve growth factor induces development of connective tissue-type mast cells in vitro from murine bone marrow cells. J Exp Med. 1991;174:7-14. Welker P, Grabbe J, Gibbs B, Zuberbier T, Henz BM. Nerve growth factor-beta induces mast-cell marker expression during in vitro culture of human umbilical cord blood cells. Immunology.2000; 99:418-26. Bracci-Laudiero L, Celestino D, Starace G, Antonelli A, Lambiase A, Procoli A, Rumi C, Lai M, Picardi A, Ballatore G, Bonini S, Aloe L. CD34-positive cells in human umbilical cord blood express nerve growth factor and its specific receptor TrkA. J Neuroimmunol. 2001;136:130-9. Thorpe LW, Stach RW, Hashim GA, Marchetti D, Perez-Polo JR. Receptors for nerve growth factor on rat spleen mononuclear cells. J Neurosci Res 1987;17:128-34. Brodie C, Gelfand EW. Functional nerve growth factor receptors on human B lymphocytes. Interaction with IL-2. J Immunol. 1992 ;148:3492-7. Ehrhard PB, Erb P, Graumann U, Otten U. Expression of nerve growth factor and nerve growth factor receptor tyrosine kinase Trk in activated CD4-positive T-cell clones. Proc Natl Acad Sci U S A. 1993;90:10984-8. Ehrhard PB, Ganter U, Bauer J, Otten U. Expression of functional trk protooncogene in human monocytes. Proc Natl Acad Sci USA 1993; 90: 5423-5427. Nilsson G, Forsberg-Nilsson K, Xiang Z, Hallböök F, Nilsson K, Metcalfe DD.Human mast cells express functional TrkA and are a source of nerve growth factor. Eur J Immunol. 1997; 27:2295-301. Noga O, Englmann C, Hanf G, Grützkau A, Guhl S, Kunkel G. Activation of the specific neurotrophin receptors TrkA, TrkB and TrkC influences the function of eosinophils. Clin Exp Allergy. 2002;32:1348-54. Aloe L and Levi Montalcini R. Mast cells increase in tissues of neonatal rats injected with nerve growth factor. Brain Res 1977; 133:358-366. Kawamoto K, Okada T, Kannan Y, Ushio H, Matsumoto M, Matsuda H. Nerve growth factor prevents apoptosis of rat peritoneal mast cells through the trk proto-oncogene receptor. Blood. 1995;86:4638-44. Bullock ED and Johnson EM. Nerve growth factor induces the expression of certain cytokines genes and bcl2 in mast cells: potential role in survival promotion. J. Biol. Chem. 1996; 271:27500-27508. Takafuji S, Bischoff SC, De Weck AL, Dahinden CA Opposing effects of tumor necrosis factor-a and nerve growth factor upon leukotriene C4 production by human eosinophils triggered with N-formyl-methionyl-leuyl-phenylalanine. Eur. J. Immunol. 1992; 22: 969-974. Bischoff SC, Dahinden CA. Effect of nerve growth factor on the release of inflammatory mediators by mature human basophils. Blood 1992; 79: 2662-2669. Sin AZ, Roche EM, Togias A, Lichtenstein LM, Schroeder JT. Nerve growth factor or IL-3 induces more IL-13 production from basophils of allergic subjects than from basophils of nonallergic subjects. J Allergy Clin Immunol. 2001;108:387-93. Gibbs BF, Zillikens D, Grabbe J. Nerve growth factor influences IgE-mediated human basophil activation: functional properties and intracellular mechanisms compared with IL-3.Int Immunopharmacol. 2005;5:735-47. Silver MR, Margulis A, Wood N, Goldman SJ, Kasaian M, Chaudhary D. IL-33 synergizes with IgE-dependent and IgE-independent agents to promote mast cell and basophil activation. Inflamm Res. 2010;59:207-18. Mazurek N, Weskamp G, Erne P, Otten U. Nerve growth factor induces mast cell degranulation without changing intracellular calcium levels. FEBS Lett. 1986;198:315-20. Horigome K, Pryor JC, Bullock ED, Johnson EM, Jr. Mediator release from mast cells by nerve growth factor. Neurotrophin specificity and receptor mediation. J Biol Chem 1993; 268: 14881-14887. Welker P, Grabbe J, Grützkau A, Henz BM. Effects of nerve growth factor (NGF) and other fibroblast-derived growth factors on immature human mast cells (HMC-1). Immunology. 1998;94:310-7. Murakami M, Tada K, Nakajima K, Kudo I. Cyclooxygenase-2-dependent delayed prostaglandin D2 generation is initiated by nerve growth factor in rat peritoneal mast cells: its augmentation by extracellular type II secretory phospholipase A2. J Immunol. 1997;159:439-46. Marshall JS, Gomi K, Blennerhassett MG, Bienenstock J. Nerve growth factor modifies the expression of inflammatory cytokines by mast cells via a prostanoid-dependent mechanism. J Immunol. 1999;162:4271-6. Hamada A, Watanabe N, Ohtomo H, Matsuda H. Nerve growth factor enhances survival and cytotoxic activity of human eosinophils. Br J Haematol 1996; 93: 299-302. Kannan Y, Ushio H, Koyama H, Okada M, Oikawa M, Yoshihara T, Kaneko M, Matsuda H. Nerve growth factor enhances survival, phagocytosis, and superoxide production of murine neutrophils. Blood 1991; 77: 1320-1325. Gee AP, Boyle MD, Munger KL, Lawman MJ, Young M.Nerve growth factor: stimulation of polymorphonuclear leukocyte chemotaxis in vitro. Proc Natl Acad Sci U S A. 1983;80:7215-8. Boyle MDP, Lawman MJP, Gee AP, Young M. Nerve growth factor: a chemotactic factor for polymorphonuclear leukocytes in vivo. J Immunol 1985; 134: 564-568. Sawada J, Itakura A, Tanaka A, Furusaka T, Matsuda H. Nerve growth factor functions as a chemoattractant for mast cells through both mitogen-activated protein kinase and phosphatidylinositol 3-kinase signalling pathways. Blood. 2000 Mar 15;95(6):2052-8. Quarcoo D, Schulte-Herbrüggen O, Lommatzsch M, Schierhorn K, Hoyle GW, Renz H, Braun A. Nerve growth factor induces increased airway inflammation via a neuropeptide-dependent mechanism in a transgenic animal model of allergic airway inflammation. Clin Exp Allergy. 2004; 34:1146-51. Bennett G, al-Rashed S, Hoult JR, Brain SD. Nerve growth factor induced hyperalgesia in the rat hind paw is dependent on circulating neutrophils. Pain. 1998;77:315-22. Foster PA, Costa SK, Poston R, Hoult JR, Brain SD. Endothelial cells play an essential role in the thermal hyperalgesia induced by nerve growth factor. FASEB J. 2003;17:1703-5. Beigelman A, Levy J, Hadad N, Pinsk V, Haim A, Fruchtman Y, Levy R. Abnormal neutrophil chemotactic activity in children with congenital insensitivity to pain with anhidrosis (CIPA): the role of nerve growth factor. Clin Immunol. 2009;130:365-72. Thorpe LW, Perez-Polo JR. The influence of nerve growth factor on the in vitro proliferative response of rat spleen lymphocytes. J Neurosci Res 1987; 18: 134-139. Franklin RA, Brodie C, Melamed I, Terada N, Lucas JJ, Gelfand EW. Nerve growth factor induces activation of MAP-kinase and p90rsk in human B lymphocytes. J Immunol. 1995;154:4965-72. Melamed I, Kelleher CA, Franklin RA, Brodie C, Hempstead B, Kaplan D, Gelfand EW Nerve growth factor signal transduction in human B lymphocytes is mediated by gp140trk. Eur J Immunol 1996; 26:1985-92. Coppola V, Barrick CA, Southon EA, Celeste A, Wang K, Chen B, Haddad el-B, Yin J, Nussenzweig A, Subramaniam A, Tessarollo L. Ablation of TrkA function in the immune system causes B cell abnormalities. Development. 2004;131:5185-95. Sato Y, Tsuboi Y, Kurosawa H, Sugita K, Eguchi M. Anti-apoptotic effect of nerve growth factor is lost in congenital insensitivity to pain with anhidrosis (CIPA) B lymphocytes. J Clin Immunol. 2004;24:302-8. Otten U, Ehrhard P, Peck R. Nerve growth factor induces growth and differentiation of human B lymphocytes. Proc Natl Acad Sci U S A. 1989;86:10059-63. Kimata H, Yoshida A, Ishioka C, Kusunoki T, Hosoi S, Mikawa H. Nerve growth factor specifically induces human IgG4 production. Eur J Immunol. 1991;21:137-41. Brodie C, Gelfand EW. Regulation of immunoglobulin production by nerve growth factor: comparison with anti-CD40. J Neuroimmunol. 1994;52:87-96. Brodie C, Oshiba A, Renz H, Bradley K, Gelfand EW. Nerve growth-factor and anti-CD40 provide opposite signals for the production of IgE in interleukin-4-treated lymphocytes. Eur J Immunol. 1996;26:171-8. Abram M, Wegmann M, Fokuhl V, Sonar S, Luger EO, Kerzel S, Radbruch A, Renz H, Zemlin M. Nerve growth factor and neurotrophin-3 mediate survival of pulmonary plasma cells during the allergic airway inflammation. J Immunol. 2009;182:4705-12.
la Sala A, Corinti S, Federici M, Saragovi HU, Girolomoni G. Ligand activation of nerve growth factor receptor TrkA protects monocytes from apoptosis. J Leukoc Biol.2000; 68: 104-10. Noga O, Peiser M, Altenähr M, Knieling H, Wanner R, Hanf G, Grosse R, Suttorp N. Differential activation of dendritic cells by nerve growth factor and brain-derived neurotrophic factor. Clin Exp Allergy. 2007;37:1701-8. Samah B, Porcheray F, Gras G. Neurotrophins modulate monocyte chemotaxis without affecting macrophage function. Clin Exp Immunol. 2008;151:476-86. Susaki Y, Shimizu S, Katakura K, Watanabe N, Kawamoto K, Matsumoto M, Tsudzuki M, Furusaka T, Kitamura Y, Matsuda H. Functional properties of murine macrophages promoted by nerve growth factor. Blood. 1996;88:4630-7. Barouch R, Kazimirsky G, Appel E, Brodie C.Nerve growth factor regulates TNF-alpha production in mouse macrophages via MAPkinase activation. J Leukoc Biol. 2001;69:1019-26. Bracci-Laudiero L, Aloe L, Caroleo MC, Buanne P, Costa N, Starace G, Lundeberg T. Endogenous NGF regulates CGRP expression in human monocytes, and affects HLA-DR and CD86 expression and IL-10 production. Blood. 2005;106:3507-14. Bracci-Laudiero L, Aloe L, Stenfors C, Tirassa P, Theodorsson E, Lundberg T. Nerve growth factor stimulates production of neuropeptide Y in human lymphocytes. Neuroreport. 1996;7:485-8. Bracci-Laudiero L, Aloe L, Buanne P, Finn A, Stenfors C, Vigneti E, Theodorsson E, Lundeberg T. NGF modulates CGRP synthesis in human B-lymphocytes: a possible anti-inflammatory action of NGF? J Neuroimmunol. 2002;123:58-65. Ma W, Dumont Y, Vercauteren F, Quirion R. Lipopolysaccharide induces calcitonin gene-related peptide in the RAW264.7 macrophage cell line. Immunology. 2010;130:399-409. Harzenetter MD, Novotny AR, Gais P, Molina CA, Altmayr F, Holzmann B. Negative regulation of TLR responses by the neuropeptide CGRP is mediated by the transcriptional repressor ICER. J Immunol. 2007;179:607-15. Brain SD. Sensory neuropeptides: their role in inflammation and wound healing. Immunopharmacology. 1997;37:133-52. Delgado M, Pozo D, Ganea D. The significance of vasoactive intestinal peptide in immunomodulation. Pharmacol Rev. 2004;56:249-90. Prod”homme T, Weber MS, Steinman L, Zamvil SS. A neuropeptide in immune-mediated inflammation, Y? Trends Immunol. 2006;27:164-7. Villoslada P, Hauser SL, Bartke I, Unger J, Heald N, Rosenberg D, Cheung SW, Mobley WC, Fisher S, Genain CP. Human nerve growth factor protects common marmosets against autoimmune encephalomyelitis by switching the balance of T helper cell type 1 and 2 cytokines within the central nervous system. J Exp Med. 2000;191:1799-806. Arredondo LR, Deng C, Ratts RB, Lovett-Racke AE, Holtzman DM, Racke MK. Role of nerve growth factor in experimental autoimmune encephalomyelitis. Eur J Immunol. 2001;31:625-33. Flügel A, Matsumuro K, Neumann H, Klinkert WE, Birnbacher R, Lassmann H, Otten U, Wekerle H.Anti-inflammatory activity of nerve growth factor in experimental autoimmune encephalomyelitis: inhibition of monocyte transendothelial migration. Eur J Immunol. 2001;31:11-22. Micera A, Properzi F, Triaca V, Aloe L. Nerve growth factor antibody exacerbates neuropathological signs of experimental allergic encephalomyelitis in adult lewis rats. J Neuroimmunol. 2000;104:116-23. Barada KA, Mourad FH, Sawah SI, Khoury C, Safieh-Garabedian B, Nassar CF, Tawil A, Jurjus A, Saadé NE.Up-regulation of nerve growth factor and interleukin-10 in inflamed and non inflamed intestinal segments in rats with experimental colitis. Cytokine. 2007;37:236-45. Reinshagen M, Rohm H, Steinkamp M, Lieb K, Geerling I, Von Herbay A, Flämig G, Eysselein VE, Adler G. Protective role of neurotrophins in experimental inflammation of the rat gut. Gastroenterology. 2000;119:368-76. Ma D, Wolvers D, Stanisz AM, Bienenstock J. Interleukin-10 and nerve growth factor have reciprocal upregulatory effects on intestinal epithelial cells. Am J Physiol Regul Integr Comp Physiol. 2003;284:R1323-9. Reinshagen M, Patel A, Sottili M, Nast C, Davis W, Mueller K, Eysselein V. Protective function of extrinsic sensory neurons in acute rabbit experimental colitis. Gastroenterology. 1994;106:1208-14. Reinshagen M, Flämig G, Ernst S, Geerling I, Wong H, Walsh JH, Eysselein VE, Adler G. Calcitonin gene-related peptide mediates the protective effect of sensory nerves in a model of colonic injury. J Pharmacol Exp Ther. 1998;286:657-61. Gillardon F, Eschenfelder C, Rush RA, Zimmerman M. Increase in neuronal Jun immunoreactivity and epidermal NGF levels following UV exposure of rat skin. Neuroreport. 1995;6:1322-4. Townley SL, Grimbaldeston MA, Ferguson I,et al. Nerve growth factor, neuropeptides, and mast cells in ultraviolet-B-induced systemic suppression of contact hypersensitivity responses in mice. J Invest Dermatol. 2002;118:396-401. Legat FJ, Jaiani LT, Wolf P, Wang M, Lang R, Abraham T, Solomon AR, Armstrong CA, Glass JD, Ansel JC. The role of calcitonin gene-related peptide in cutaneous immunosuppression induced by repeated subinflammatory ultraviolet irradiation exposure. Exp Dermatol. 2004;13:242-50. Ashaina A, Moro O, Hosoi J, Lmerner EA, Xu S, Takashima A and Granstein RD. Specific induction of cAMP in Langherans cells by calcitonin gene-related peptide: relevance to functional effects. Proc. Natl. Acad Sci. 1995;92:8323-8327. Raud J, Lundeberg T, Brodda-Jansen G, Theodorsson E, and Hedqvist P. Potent anti-inflammatory action of calcitonin gene-related peptide. Biochem. Biophys. Res. Commun. 1991;180:1429-1435. Millet I, Phillips RJ, Sherwin RS, Ghosh S, Voll RE, Flavell RA, Vignery A, Rincón M.Inhibition of NF-kappaB activity and enhancement of apoptosis by the neuropeptide calcitonin gene-related peptide. J Biol Chem. 2000;275:15114-21. Altmayr F, Jusek G, Holzmann B.The neuropeptide calcitonin gene-related peptide causes repression of tumor necrosis factor-alpha transcription and suppression of ATF-2 promoter recruitment in Toll-like receptor-stimulated dendritic cells. J Biol Chem. 2010;285:3525-31. Rook GA, Lightman SL, Heijnen CJ. Can nerve damage disrupt neuroendocrine immune homeostasis? Leprosy as a case in point. Trends Immunol. 2002;23:18-22. Holzer P. Role of visceral afferent neurons in mucosal inflammation and defense. Curr Opin Pharmacol. 2007;7:563-9. Boissé L, Chisholm SP, Lukewich MK, Lomax AE.Clinical and experimental evidence of sympathetic neural dysfunction during inflammatory bowel disease. Clin Exp Pharmacol Physiol. 2009;36:1026-33. Kroeger I, Erhardt A, Abt D, Fischer M, Biburger M, Rau T, Neuhuber WL, Tiegs G.The neuropeptide calcitonin gene-related peptide (CGRP) prevents inflammatory liver injury in mice. J Hepatol. 2009;51:342-53. Dirmeier M, Capellino S, Schubert T, Angele P, Anders S, Straub RH Lower density of synovial nerve fibres positive for calcitonin gene-related peptide relative to substance P in rheumatoid arthritis but not in osteoarthritis. Rheumatology. 2008;47:36-40. Christianson JA, Riekhof JT, Wright DE. Restorative effects of neurotrophin treatment on diabetes induced cutaneous axon loss in mice. Exp Neurol. 2003; 179:188-99. Molliver DC, Lindsay J, Albers KM, Davis BM. Overexpression of NGF or GDNF alters transcriptional plasticity evoked by inflammation. Pain. 2005;113:277-84.